UNITED STATES: Principle Power has signed a memorandum of understanding with a local government agency in the north of California to develop an offshore wind project. Principle signed the MoU with the Redwood Coast Energy Authority (RCEA), according to a blog on the authority's website. A 120MW project consisting of 15 turbines could be developed. RCEA says the most promising sites for wind development off Humboldt County are 24km to 32km offshore in deep water. Principle Power has been engaged in exploratory meetings with RCEA, environmental groups, fishermen, and other parties. The company declined to comment. Any project would take "a number of years to complete", said RCEA. "Current transmission capacity out of Humboldt County is approximately 60MW, so full development of our capacity would require a major upgrade of our transmission lines," RCEA added. California-based Principle's WindFloat floating foundation technology has been successfully piloted in a 2MW project off Portugal between 2011 and 2016. The company's 24MW Windfloat Pacific, co-developed by Deepwater Wind and planned for a site off Oregon, was dropped from the Department of Energy (DOE)'s offshore demonstration programme in May 2016. The project was unable to complete final project plans and a power purchase agreement by a May 2016 deadline. 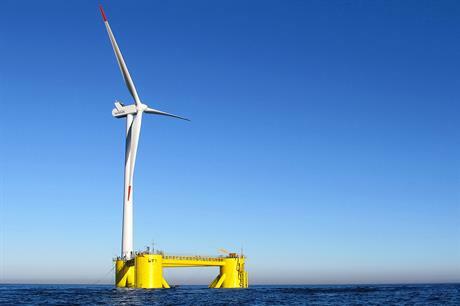 Floating offshore wind a "gilt-edged opportunity"